In my experience there is nothing better than donning the ‘Waders’ coupled with a prodding stick and venturing into the wet stuff analysing viable spots on the Lakebed in which to present a bait on or to start priming for later sessions to create a feeding spot. Having a long handle Rake is helpful to remove any unwanted twigs, weed etc that may impair line lay or Rig presentation. Providing the venue allows wading, the task must be undertaken safely feeling you’re way into the lake is a must, having a vague idea of depth and substrate you’re treading is paramount as the last thing you want is a ‘Booty’ or worse still getting stuck in a deep pocket of silt or sand. It never ceases to amaze me just how different a spot can be when you arrive above it with a prodding stick, putting a lead over it and dragging back gives you a good guide but in my mind is never as accurate as treading over it ascertaining size, depth, substrate etc with the underside of you’re Boot and a Prodding Stick. 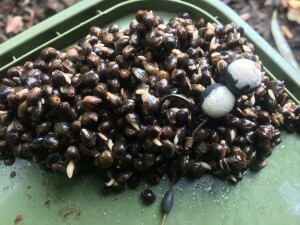 Another tip is to collect a sample from the spot, by simply digging in the handle or raking over the lakebed surface with a rake and carefully bringing it up to the surface can often reveal secrets like Natural food larders- Bloodworm banks or Other aquatic life that Carp snack on or perhaps even a section of Clay which Carp are renowned for flanking on for mineral absorption to aid health and well being. 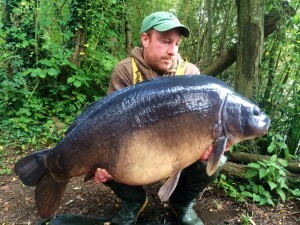 These are a reason for Carp to visit the spot even before application of pre-bait. This process helped piece together the capture of a very special fish that was on my most wanted list recently. By venturing out into the ‘drink’ I was able to ascertain how far I could fish my Hookbait safely stacking the odds in my favour under a Tree-line nearby a Coots nest and a subsurface jungle of branches and debris which the Carp use when it’s hot or you get a good South Westerly blow on the pond. The money spot within the spot was the very edge of the gravel that met a smooth silty area in around 4.5 -5 feet of water. I’d previously fished the spot and received lots of liners and lost a fish, so I decided to firstly calculate how far I could fish allowing for stretch and rod compression before the Carp could make sanctuary of the gnarly snags, then clean the spot coming back towards the Rod angle for better line lay then bait the area with Hemp and a mixture of Velocity AK4R and P-Nut+ Boilie chops in for the next session. I opted for a slightly longer than normal leader of about 4-5′ of Camflex lead- free for added protection against the snags and aggressive gravel, this was fished with an inline bolt bomb as I feel this converts more bites when fishing on firm spots with small food items that are fed close together. No more than 2 hrs into the next session and my preparation and knowledge gained paid dividends, a stunning dark blue Mirror known as ‘Enoch’ in fabulous condition coupled with a healthy weight of 43-14 was securely landed on a size 6 Widegape Talon Tip which I favour when fishing a Velocity Peach n Black Pepper Fluoro Wafter over Hemp. I went on to catch a further 3 Carp to low 20’s that session off another spot within the swim that again i’d cleaned and examined as best I could given the precariously deep shelf drop off. The plan came together nicely and gave me the confidence I need to try and secure the capture a particular large ‘Bar of Gold’ before the years up hopefully. Tight Lines and all that Jazz!…..